Hello visitors today i m gonna share what is the difference between C and C++ language..
few weeks ago..i also posted about how to use C/C++ in window 7..but today i will tell u the Difference between them..
C++ is an extension of C language. This means that you can not only use the new features introduced with C++ but can also use the power and efficiency of C language. C and C++ are no more language for writing compilers and other languages, these general purpose languages are used worldwide in every field. Here is a list of differences between c and c++. 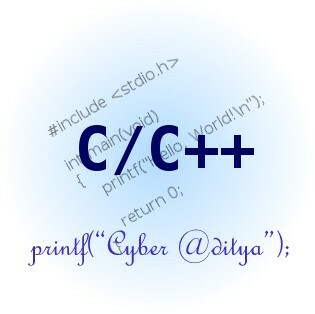 The main difference between C and C++ is that C++ is object oriented while C is function or procedure oriented. Object oriented programming paradigm is focused on writing programs that are more readable and maintainable. It also helps the reuse of code by packaging a group of similar objects or using the concept of component programming model. It helps thinking in a logical way by using the concept of real world concepts of objects, inheritance and polymorphism. It should be noted that there are also some drawbacks of such features. For example using polymorphism in a program can slow down the performance of that program. On the other hand, functional and procedural programming focus primarily on the actions and events, and the programming model focuses on the logical assertions that trigger execution of program code.